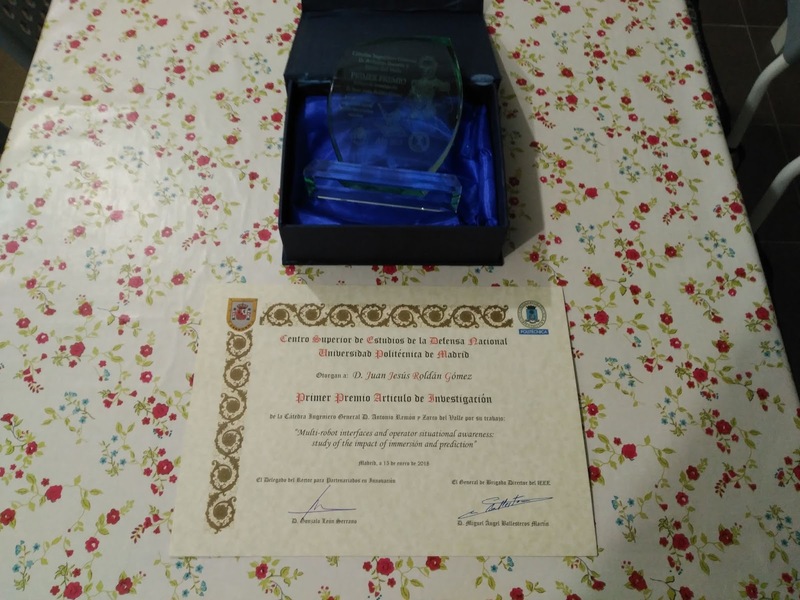 Our paper "Multi-robot interfaces and operator situational awareness: study of the impact of immersion and prediction" has been awarded with the Cátedra Ingeniero Remón y Zarco del Valle prize to the best scientific paper in defense and security. This prize is awarded annually by Universidad Politécnica de Madrid (UPM), which is my alma mater, and Centro Superior de Estudios de Defensa Nacional (CESEDEN), which is a center of the Spanish Army that deals with defense research and culture. The commitee has decided to award our paper because it presents a novel technology that will have an impact on the future of defense and security. This paper was the result of months of teamwork, starting from the multi-robot missions performed in Luxembourg in 2016 and finishing at the experiments with operators developed in Spain in 2017. Therefore, I would like to say "thanks" to my colleagues who participated in this work and "congratulations" to Elena because she contributed as much as me to this success.